This morning we welcome some congregation members from St. Anne’s parish. Some of St. John’s congregation members are visiting St. Martin-in-the-Fields parish today. In preparation for our Annual General Meeting scheduled for Sunday, February 27th, a Nominating Committee has been selected and is made up of Vic Janzen, June Rampersad, and Roger Stagg. There are a few openings on Vestry. Please speak to one of the above persons if you yourself are interested in serving on Vestry or if you would like to nominate someone else who might be interested. It’s layette time again! The Thelma Wynne Project supplies layettes for needy new mothers in our city. For this very important and necessary outreach there is a great need for new baby clothes, baby toiletries – or cash donations if you so wish. During the month of February there will be a basket at the foot of the font to receive your much appreciated donations. Thank you! The World Day of Prayer service this year will be held at St. John’s Presbyterian Church, 251 Bannerman Ave on Friday, March 4th at 7:30 p.m. This year’s service has been written by the women of Chile. Please join us! 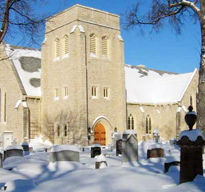 Any congregation member who wishes to have an announcement made on a Sunday is asked to give a written copy of the announcement to Canon Condo at least fifteen minutes prior to the service. Canon Condo will, in turn, make these announcements each week prior to the start of the Sunday service. Updated weekly, the site features the Cathedral Chronicle, updates, articles, and info. Links to upcoming events and next Sunday’s readings are available on the right side menu. Stay updated! Subscribe with the Email Subscription available on the left side menu. We are still looking for volunteers to donate baking for our coffee time after the 10:30 a.m. service on Sunday. Thank you so much to those who have made baking contributions! We invite you to take Sunday’s bulletin home with you and to pray for the persons on St. John’s Prayer List in your devotions. Amnesty International invites you to take on a Lenten Project. Lent begins soon. During Lent we prepare ourselves for Holy Week, when Jesus was tortured and killed. Many people in this world are, at this very time, suffering a similar fate. We invite you to write letters, emails, faxes on behalf of those who are suffering injustice, torture, and facing the possibility of death. Amnesty can provide you each week with suggestions for the letters you should be writing – or you can choose your own letters from www.amnesty.ca. If you do not have experience in letter writing for Amnesty, an Amnesty Letter Writing Circle will be meeting on Tuesday, March 1st at 27 Dundurn St. (off Maryland between Westminster and Wolseley) 7 – 9 p.m. You would be welcome to join us. If this is not convenient, please contact Tom Collings at 772-2892. Cathedral members are reminded that an email Prayer Circle operates from the Cathedral. Mondays 7 p.m. Mondays at St. Anne’s Bible Study on “The Gospel of Matthew” using the two book series by Tom Wright entitled “Matthew for Everyone”. A message from Archbishop Bruce Stavert St. George’s College , Jerusalem: I am writing to you about the availability of a limited number of bursaries for Canadians ; clergy, lay people, or theological students who would like to follow a course at St. George’s College, Jerusalem. Within the last year and a half our small Canadian bursary fund has been able to provide two bursaries of one thousand dollars each for a couple of clergy who went to St. George’s College for a course. I can provide a copy of the college course schedule for 2011 and 2012. Those who might wish to avail themselves of a bursary should contact me or Bishop Michael Bedford-Jones. We are two Canadians who sit as members of the North American Regional Committee for St. George’s College Jerusalem. Our coordinates can be found in the latest House Of Bishops Directory and the Anglican Church of Canada Directory. E Mail addresses are abstavert@videotron.ca and michaelbj94@hotmail.com. I would invite Bishops to make this information known within their dioceses. This entry was posted in Cathedral Chronicle, News. Bookmark the permalink.